Curious about the world of brush pens but aren't sure where to start? Brush Pen Illustration shows how to draw pretty much anything in 2 – 4 steps. Brush pens have taken the illustrating world by storm! This unique medium comes in hundreds of colors and produces a beautiful, soft, watercolor effect which has had lettering artists buzzing. Now, though, illustrators in all walks of art are incorporating brush pens' into their repertoire as a simple way to include color and motion into their art. Brush pens' style is reminiscent of Chinese brush painting and drawing. They offer a gentle, paint-like quality that replicate watercolor paints without having use paint and brushes. 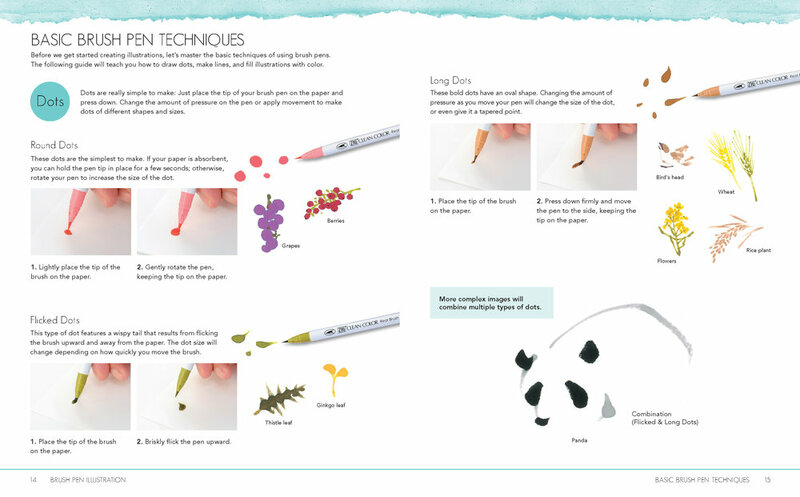 Brush Pen Illustration is a comprehensive guide which shows you how to draw pretty much everything in 2-4 easy steps; apples, zebras, penguins, flowers, this book shows you how to draw everything under the sun with fun and colorful brush pens.